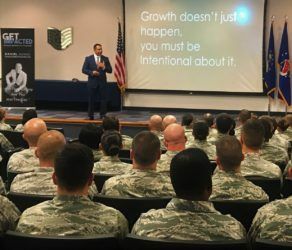 As a trainer, Gomez has created programs and workshops specifically designed to raise effective and extraordinary leaders even in our military. Gomez has personally lead multi-million dollar organizations to record profits, showing them the leadership attributes needed to create the desired results for any organization. Gomez teaches that you must first grow yourself before you can develop other leaders. Growth doesn't just happen; you must be intentional about it. How fantastic it ... See More was in an organization when your leaders became exceptional leaders, improving the quality and effectiveness of leadership is a constant challenge within many organizations as they strive to improve communication, morale, and consistency. All successful organizations understand that effective leadership is at the heart of every business and Gomez prides himself on Leadership Development. The "Two Rules" of great leadership. How to recognize and overcome "The Traps" that keep a leader from growing. Why complacency in a leader kills an organization. The importance of having a positive Influence instead of a negative one. The importance of instilling confidence in times of failure. Why mentoring young and aspiring leaders is vital to an organization's success.